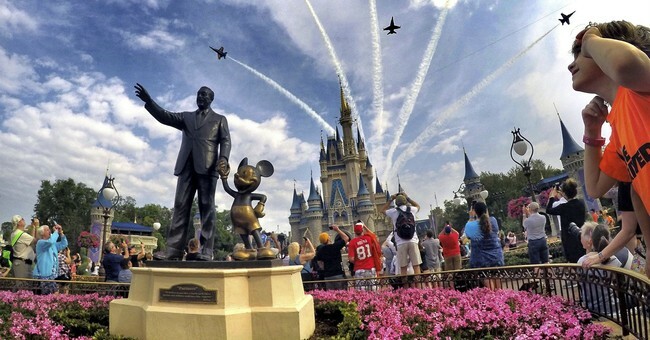 A New York City veteran has reportedly been banned for life from the happiest place on earth. Holding up a “Trump 2020” sign while riding Splash Mountain. Dion Cini is an ex-marine from New York City’s Upper West Side. He was captured last week in a photograph, holding the Trump sign and wearing a “Make America Great Again” hat, at Walt Disney World. The photo was a standard group shot of all of the attraction’s riders, which is made available for purchase. Cini had also hung a similar banner elsewhere in the Magic Kingdom earlier this month. That sign was a 20-foot banner which read “Re-Elect Donald J. Trump. Keep America Great. 2020,” and was placed by Cini on Main Street, U.S.A., at the entryway to the train station. According to Disney, after the latest incident on Splash Mountain, the Trump supporter is now “permanently prevented” from visiting any of Disney’s parks. After the first offense at Disney, Cini attempted to enter Epcot but discovered that his park pass had been “paused”, so that park employees could discuss the policy violation with him. But when he subsequently held up his pro-Trump sign on Splash Mountain, he was banned for life. "Banned for life from Walt Disney World for the 2nd time in a month,” Cini wrote on what appeared to be his Facebook page. “They hate my signs, or the President? Maybe both?" Cini was also reportedly responsible for hanging a Trump re-election banner at Yankee Stadium back in July, and at the Broadway play Frozen earlier this month. Cast member Timothy Hughes said he noticed the "Trump 2020" sign while he was taking his bow, and that he grabbed the banner out of the person’s hands. Hughes believes the sign should not have been at a Disney musical. “What does it say about our country and politics when a man at the show tonight felt the need to protest Disney’s Frozen on Broadway with a pro-Trump flag?” Hughes asked. Cini, who is an ex-Marine, believes that in spite of Disney’s claims, it is his support for President Trump that ultimately got him banned. “Forty Disney employees escorted me out,” Cini told the New York Post.